When placing an order or requesting a quotation, please give part number, your required finish I.D. from the chart below, and required length. The above example is the “Slot Mount Series” gasket shown on page 11. The height is .11 inch and the width is .32 inch. The “-S-” indicates a soft gasket. The “SN” indicates a bright tin finish. 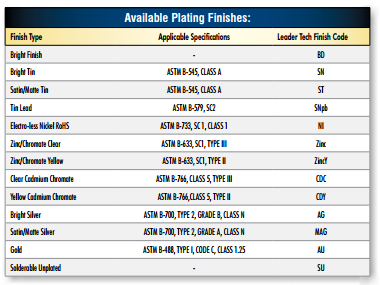 See list below for available finishes. This part is available in lengths of 16 inches. Consult factory for custom lengths or for availability in 25’ coils. Standard plating finish is .0001 inch (.0025 mm) minimum. Plating processes and thicknesses may be varied to meet customer needs. Standard plating finish for gold is 0.00005 inches. See adjacent list of available finishes and consult factory for additional options. 1. Remove all grease and oily residue with a solvent such as isopropyl alcohol/water mixture (rubbing alcohol) or heptane. Dry and smooth the mounting surface with emery cloth if necessary. 2. Peal off the protective paper backing from the pressure sensitive adhesive tape. 3. Place the gasket in correct position. Press firmly to ensure a good bond to surface. Avoid repositioning, which might impair the effectiveness of the adhesive or may bend or kink the strip. NOTE: On strips where fingers cover the solid portion of the gasket, pressure may be applied by inserting a mandrel in the strip and pressing down. 4. At room temperature approximately 50% of the ultimate strength will be achieved after 20 minutes, 90% after 24 hours, and 100% after 72 hours. In some cases, bond strength can be increased and ultimate bond strength can be achieved more quickly by exposure of the bond to elevated temperature, e.g., 150°F (66°C) for 1 hour.